In order to achieve bipedal flight, birds first had to ditch two hind wings over the course of their evolution, according to a study to be published Friday in the journal Science. 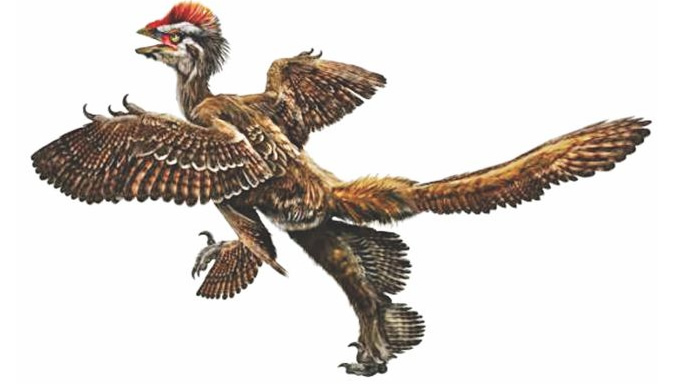 Recently, several fossils have shown that some dinosaurs had large feathers on both fore limbs and hind limbs. But, until now, no examples of this four-winged body plan have been described in birds -- or even in their most recently extinct relatives. Xiaoting Zheng, of Linyi University in China, and colleagues studied fossils in China's Shandong Tianyu Museum of Nature and identified 11 primitive bird species with clear signs of feathered hind legs. These findings suggest that this four-winged condition preceded the two-winged body plan, and that birds have gradually lost the feathers on their hind limbs over evolutionary time. Such a transition from four wings to two probably happened while the birds were gaining more scales on their hind limbs and using them more for terrestrial locomotion, according to the researchers.